The laughter of children filled the room. The tramping of callow feet, back and forth, in and out of the Abraham Lincoln Hall in The Hill Center at the Old Naval Hospital in Washington, D.C., reverberates throughout the entire second level of the building. 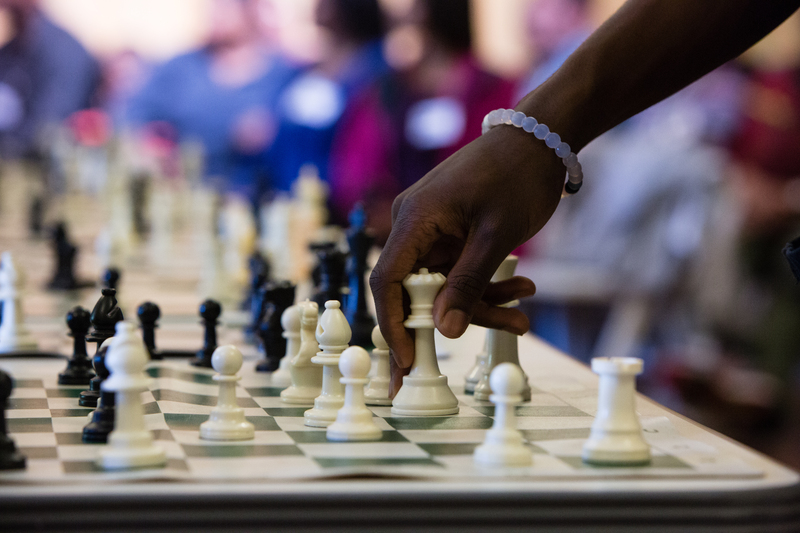 In May, children ranging in age from 8 to 12 gathered for Chess Challenge in DC’s fifth annual simultaneous exhibition (“simul” in chess jargon) — a game in which one player takes on multiple players at one time. On this day, 30 children wandered to their places at the long tables lined with white-and-green-checked chessboards. They sat anxiously in sturdy white folding chairs, awaiting their turns to battle the three young chess masters from New York who traveled nearly five hours by bus just for them; three then-17-year-old chess players who became masters before they became teens: James Black Jr., Joshua Colas and Justus Williams. Earlier that day, Black Jr., Colas and Williams were greeted by the Chess Challenge in DC’s chair and president Meg Hauge and executive director Suzy Hirsch. The young men had made the trek from New York to D.C. for the simul every year since they were 12 years old, competing against children in their age group or younger. Three months later they would be off to college to attend Webster University in Missouri. Matt, (L) contemplates his next move as Joshua Colas looks on late in their chess match at the Hill Center in Washington, D.C., on May 16. This year, the three masters will face 10 players each. They sit around talking among themselves and mingling with the guests who begin to trickle in. They answer questions about their skill levels and techniques, their semblance to society, their status as role models. Williams scans the room as the younger children pop in and out. The thought of knowing that they are role models to these kids, whether they prefer to be or not, crosses his mind. He smirks. The boards are set. Rooks, knights, bishops, kings, queens and pawns are all neatly aligned, waiting to be maneuvered by a gentle hand — each touch a calculated move that can either be brilliantly executed or go terribly wrong. The competitors wear black T-shirts emblazoned with the program’s name, Chess Challenge in DC, on the front. “Encouraging Success with Each Move” appears on their backs. Colas, 18, is the youngest of the three to achieve master status. Ironically, Colas is also the one who failed to take interest in chess right away after being introduced to the game by his father, Guy Colas. After discovering his new set of skills, Colas worked to hone them. He began studying the game, perfecting techniques and competing against more skilled players at a higher level. After reaching master status — the highest amateur rank — at age 12, Colas took the game more seriously. Colas thought that if he could be the youngest master, he could definitely be the youngest grandmaster. The natural progression of a competitive chess player is to earn the ratings-based master status, followed by FIDE Master (FM), International Master (IM), and finally, the coveted title of Grandmaster (GM) — the highest skill level that can be attained in chess. To become a grandmaster, one must achieve three grandmaster norms, the highest level in tournament play, in Federation Internationale des Eches (FIDE)-sanctioned tournaments. Colas, who is a FIDE master, earned his second IM norm at the 44th Annual World Open in July. He is one norm away from achieving international master status, and has two more grandmaster norms to earn before the title belongs to him. With a tied ranking of 36 out of 6,153 in New York, Williams, 18, continues to dominate. Williams has always been competitive, but the incentive to even consider chess as a hobby is what made the FIDE master want to join his school’s chess club. After moving to a new address in the Bronx, Williams took interest in P.S. 70 Max Schoenfeld, an elementary school located two blocks away from his new home. He wanted to attend the school because it was within walking distance. His mother, Latisha Williams, agreed to let him walk to school by himself, but under one condition. Joshua Colas moves his queen during the simultaneous chess matches at the Hill Center in Washington, D.C., on May 16. It was a hobby that piqued Williams’ interest so much that he never let it go. He commuted from the Bronx to Brooklyn to attend Intermediate School 318 (The Eugenio Maria de Hostos School), where he continued to play. 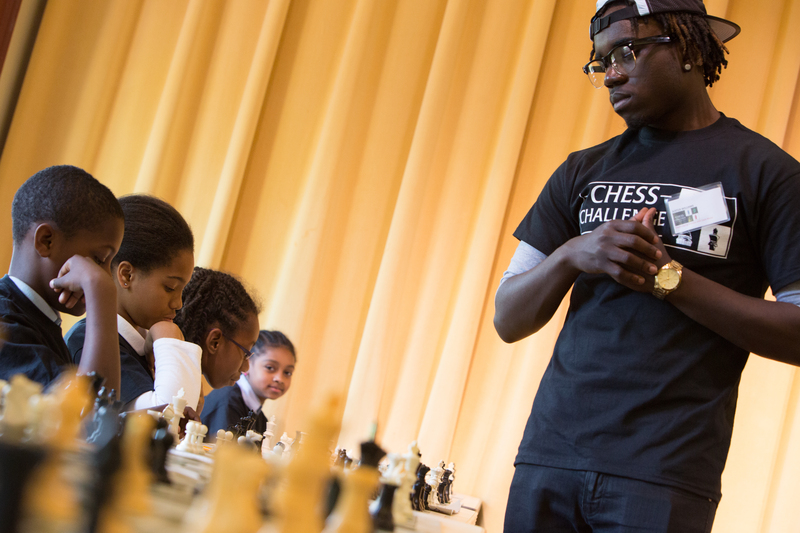 Williams, along with four other members of the school’s chess team, were featured in Brooklyn Castle, an award-winning documentary detailing their lives as chess players in the inner city. In June, immediately after graduating from Bronx Center for Science and Mathematics, Williams found himself traveling to Norway to compete in the 9th Sveins Memorial, an invitational tournament in Oslo. There, Williams mingled with some of the best players chess has to offer. Like Colas, Williams has already earned two IM norms, and needs one more before becoming an international master. Black Jr.’s journey to becoming a chess master differs from that of his comrades. In third grade, Black Jr.’s father, James Black Sr., brought home a chess set in search of a partner. Black Jr. was his father’s first choice, except the then-8-year-old could not fully grasp the concept of the game. It didn’t stop there. After winning against his father, Black Jr. still had to face his coach at school, who seemed almost impossible to beat. The thought of claiming a victory over someone much older and more experienced was intimidating to Black Jr., but didn’t deter him from practicing hard enough to eventually beat his coach, just as he had done his father. Now, the national master has no worries about age or gender when competing against others. As of September, Colas is ranked third and Black Jr. is tied for 20th in the U.S. Chess Federation’s Top 100 Age 17 category in the United States. Williams is ninth in the Top 100 Age 18 category. While all three masters hail from New York, they were unfamiliar with each other until chess connected them eight years ago. Black Jr. resided in Brooklyn while Williams lived in the Bronx. Colas came from Westchester County, and the young men met when they were around 9 years old and immediately clicked, largely because they all shared the same features, similar complexions and coarse hair. They were young black men in an unfamiliar world where black faces were rarely seen. Outside of chess, they also shared the same tastes in music, fashion and social interests. 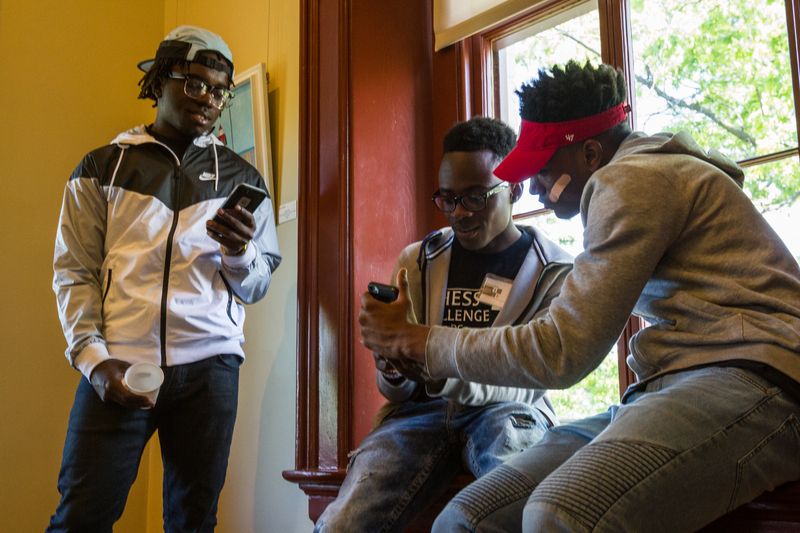 From left to right: Justus Williams, Joshua Colas and James Black Jr. share photos before the start of their simultaneous chess matches at the Hill Center in Washington, D.C., on May 16. The three teenage chess masters share a close friendship and will all be attending Webster University on chess scholarships in the fall. Black players in professional chess are quite a rarity. Tracking down the exact number of professional black chess players is difficult because the U.S. Chess Federation does not keep track of its members by ethnicity. It’s safe to guess, though, that the numbers of African-American chess players are modest. According to The Chess Drum — a website created by Florida A&M University associate professor of business Daaim Shabazz that “highlights the chess activities within the African diaspora” — there are 205 male players of African descent who hold master titles. Out of those 205, 100 are black Americans. Only 15 black American players have reached master level since 2011. Jamaican-American Maurice Ashley became the first black grandmaster at age 33 after defeating Romanian Adrian Negulescu at a New York chess tournament in 1999. Only four other black players have joined Ashley as grandmasters in the past 17 years. Black Jr., Colas and Williams are determined to fulfill their dreams as grandmasters a lot sooner than age 33, and hope to attain them in a lot shorter time than 17 years. Back at the Chess Challenge, the kids stare intently into the eyes of the chess masters as if a certain look hints at which move the master will make next. The experienced players stare back, not really searching for answers, but seeing more of a reflection in the eyes of their not-so-distant pasts. They were once the kids they are now competing against. This program is special. 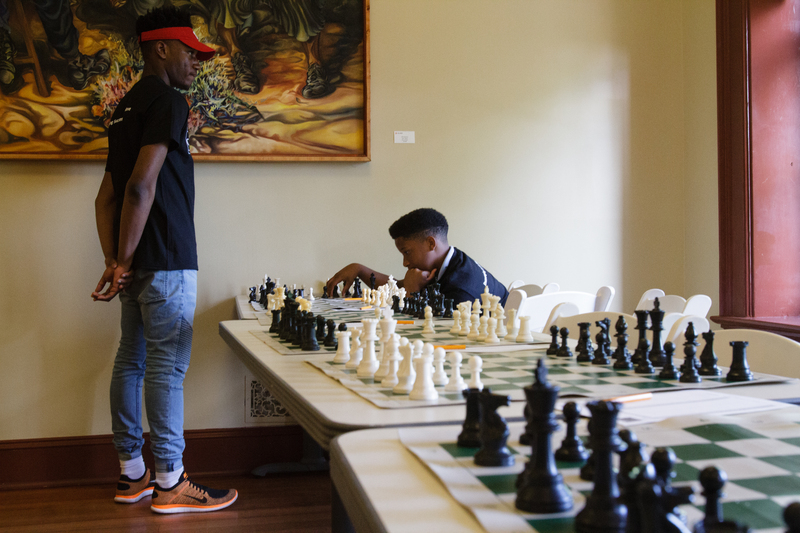 The masters and players are each connected by not only chess, but also youth and competition, shared experiences and the familiarity of being an inner-city kid using the games as a lens to discover something broader and greater than themselves. The boys and girls stroll over to the set tables, picking the first chair available. They are loud and boisterous. Friendly banter and nervous laughter fill the air. Smiles seem permanently painted on the faces of each child in the room. They are viewed as they are: nothing more than eager kids, ready for battle. Eight years ago, so were the three chess masters. Sometimes the greetings turn to befuddlement. Whatever image of a “traditional” chess player that comes to mind is completely obliterated by Black Jr.’s, Colas’ and Williams’ appearances. The masters each have their own style: Williams’ earrings and short, honey blonde-tipped dreadlocks, Black Jr.’s curly, box cut hair and Colas’ stylish frames and swag may leave some perplexed. James Black Jr. waits for a move from his final opponent at the simultaneous chess matches at the Hill Center in Washington, D.C., on May 16, 2016. He was the fastest of the three masters to defeat all 10 of his opponents. Is there a handbook with a certain section, page number and paragraph describing what a chess master looks like? If one is unfamiliar with chess and its players, would one really be able to tell who may have achieved the game’s highest honor? Do they have a distinct scent? Who dictates what we should look like to become successful in our respective fields, teams or clubs? It’s a reality the three young men deal with on occasion: the shock, the doubting of their capabilities, the stereotypes. It’s also a bonding period for them. Being a young black man in uncharted territory can be scary, but together? Life becomes a little easier. One place that has no qualms about appearances seems to be Webster University, where two of the chess masters are attending on full scholarships. The university, located in the St. Louis suburb of Webster Groves, has the No. 1 ranked Division I collegiate chess team in the United States. Colas and Williams began their first semester at Webster in August. Due to personal family matters, Black Jr. opted to sit out of college for a year, but will be attending Webster next fall. In the meantime, he will continue to compete and practice his craft. “When I tell people I play chess, a lot of people tend to be like, ‘wow, you don’t look like the type.’ — James Black Jr. So far, Colas and Williams have been enjoying and adjusting to their new lives in college. The young men spend the week attending required curriculum courses and using their weekends to meet with chess teammates for studying and friendly competitions. According to Williams, “chess homework” is doled out, typically three assignments, to be completed by members of the team. One of the school’s best aspects for Colas is having free access to chess programs and books that had not previously been available. In D.C., the Abraham Lincoln Hall transforms from an uproarious room to complete stillness and silence. The shuffling of feet, friendly banter and laughter cease. Painted smiles that were once on the face of every child are replaced by stoic expressions and pure concentration. Each master starts from one end of the table, making his first move. The opponent also makes a move, then waits patiently as the master repeats this process nine more times. 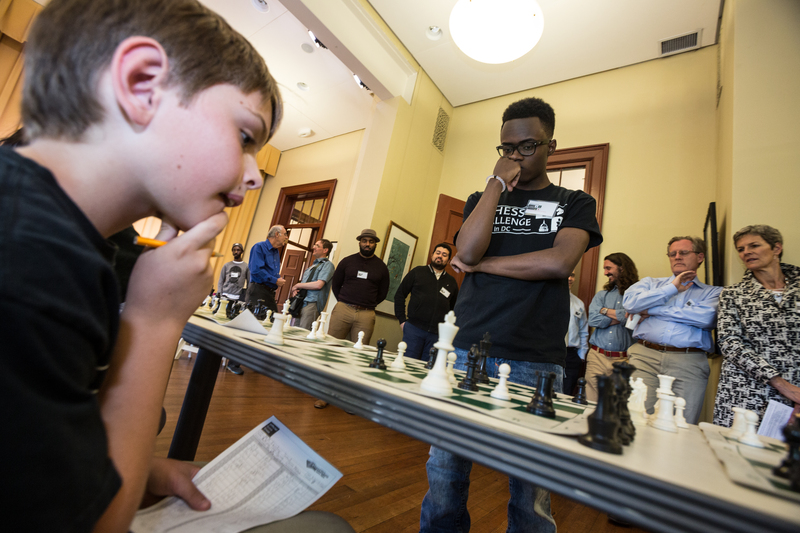 Chess master Justus Williams watches as a student makes a move during the simultaneous chess matches at the Hill Center in Washington, D.C., on May 16. Minutes pass. Checkmate. An hour goes by. A player tries to make a move that happens to be illegal. Colas catches it and gently shows his opponent the error, using his chess piece as a teaching tool. His opponent corrects himself before Colas makes his next move. Only three players remain. Minutes pass. Checkmate. Another hour goes by. The children whose games have just ended walk over to shake the hands of their more experienced opponent, then reset their boards. Some shyly ask the masters for autographs before taking a seat in the crowd. After Colas’ final move with the last opponent standing, a jolt of energy returns to the room. The kids are met with a round of applause for their valiant efforts. The three chess masters and the children gather around the chessboards to take a group picture. Chess pieces in hand, they smile collectively. Before heading back on the bus for their nearly five-hour trip back to New York, the three young men stop to chat with the kids, the same kids they were not very long ago. Before, the masters could only see their own pasts. Now? They see potential, how far they’ve come and, more importantly, how far they will go. They see a reflection of themselves. They see how bright their futures will be.